We tend to think that when we are young, all of our allergies will come about and let us know that they’re there. Well, that’s wrong. Entirely wrong. In fact, most of our allergies that we get, whether it be to pollen, to animals, or to foods, happen to appear over time. Specifically speaking, food allergies tend to occur and reoccur the older we get. For example, a man who loves shrimp all his life may one day find that he gets an extremely itchy throat when eating shrimp. Even though he’s lived his life of 25 years eating shrimp, that doesn’t mean he can’t develop an allergy to the food now. Now, I get it. This is super scary. To be at the dinner table and potentially find out you have a new food allergy is terrifying. And, what’s the worst part? Nobody really knows how or why our bodies are allergic to such foods. Specifically, nobody really knows how or why it happens so suddenly. There is one thing we know, though. What a food allergy actually is. 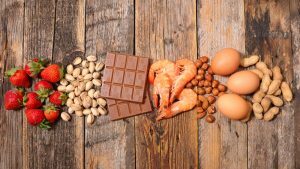 Food allergies come up in our bodies because our bodies mistakenly think that the food entering our bodies is an invader that is not welcomed. In other words, our body thinks the food coming into us is potentially harmful. That does not mean we know how the food allergy comes up, or specifically why the food allergy comes up, though. The area of the body it affects will depend on where your body releases the antihistamines and allergy fighting antibodies. Keep in mind, the way you react to a food allergy the first time may not mean your body will always react in that way. The reaction could be better, or it could be worse next time. To prepare you, I am going to briefly explain what signs you will want to specifically look out for, and potentially seek help for. Check them out below. 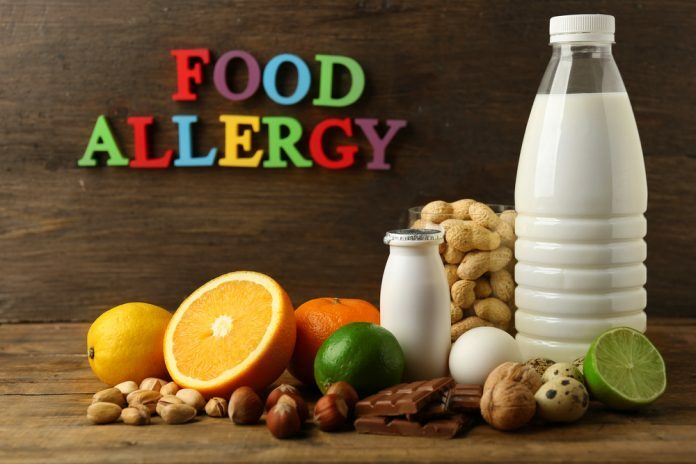 If your skin starts itching a lot, or breaking out in hives, or even flaring up as emphysema does, you may have a food allergy to something you’ve eaten in the past few minutes or hours. Such skin irritations can mean redness, skin that tends to pop up or flair up, swollen areas of skin, or severe itching. More often times than not, these irritations will be on the hands, feet, and joints. If you experience any of these signs or symptoms while eating, directly after eating, or within the hours after you’ve eaten, you may be allergic to something from your last meal or snack. 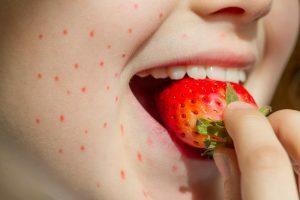 If the areas around your mouth start to look red and puffy, this is another sign that points towards food allergies. This doesn’t happen often, but it is possible. Food allergies don’t always lie on the surface of the body, they can actually go very deep according to medical professionals. Unfortunately, though scary, food allergies can go as deep as weakening the pulse or lowering the blood pressure. Keep in mind that if you have high blood pressure, and you take your medication regularly (if you have medication to take) you may not notice the dip in blood pressure. Also, if you have a regular blood pressure, you may not notice the dip unless you frequently take your blood pressure via the blood pressure cuff. That means you must be aware of a weak pulse or a funny feeling after eating certain foods. Funny feelings can have you feeling faint, for example. Keep in mind, this symptom can be very minimal, but it can also be life threatening. It can jump from minimal to life threatening extremely quick, too. If you’re feeling a different way after eating certain foods, don’t wait to see if it goes away. Get it checked out immediately if you have a bad feeling about it, or if you haven’t experienced it before. Food allergies can really target any area of the body, and they tend to hover towards the mouth a lot. If you’re experiencing itching around the mouth, or if you’re feeling a slight dry cough after eating, chances are you may be allergic to something you’ve just eaten. Look out for these allergic reactions after eating fruits and vegetables. Fruits and vegetables have proteins within them that make our body’s think we are ingesting pollen. In other words, some person’s body that’s allergic to pollen produces the same effect. Typically, according to health care professionals, these symptoms tend to go away a few minutes after eating the food that makes us secrete allergy fighting antibodies. That doesn’t make the feeling any less uncomfortable. Yet again, this is another sign not to ignore when experiencing food allergies. Tightness of the chest, or the inability to swallow food, means you need to seek medical attention fast. If your throat is closing up, or if you are experiencing severe tightness in your chest, your body is being put on full overload to combat the food allergies. The problem with this is that it’s hurting you more than helping you. When this happens, your body secretes a massive amount of white blood cells towards the esophagus. This, in turn, causes a severe inflammation of the throat, leading you to feel as if you can’t breathe. Get help as soon as possible. If the food you eat tends to get you running to the bathroom immediately after, or if the food you eat tends to make you nauseous or give you a stomach ache, you probably have an allergy towards it. This doesn’t mean you need immediate medical attention, though. But it also doesn’t mean you have lactose intolerance. The choice is up to you with this symptom. You can live with the pain of constantly being in the bathroom if the food means that much to you or you can avoid it entirely. But keep in mind, if any of the other above symptoms start to happen, cut that food off immediately.